SSL, need I say more? It can be a pain to manage technically, a pain to manage for a business, confusing for beginners and sometimes the more experienced developers among us. Let’s Encrypt are a free automated open certificate authority, aiming to end all of that by making SSL free and simple to use — with a few commands you can encrypt your website traffic. At SOON_ we use Salt Stack, an open source remote execution and configuration management tool, to manage our infrastructure. We wanted to see how we might manage Let’s Encrypt with Salt. I lied, we aren't getting started just yet as there are a couple of things to bear in mind first. As far as I can tell, Let’s Encrypt will work best with single server domains, so no Load Balancers, if you run a Load Balancer through HAProxy or the like you might be able to do something there. EC2 ELBs make things a little bit trickier, Let’s Encrypt does have beta support for DNS verification so that might be worth looking at but is beyond the scope of this article. I won’t be covering Salt Stack basics, they have some great tutorials and documentation on their site so do take a look if you are not familiar. All the code examples use Salt’s Stateconf renderer which gives some nice sugar on top of Salts default YAML formatted states, I highly recommend it, you can read up on it here. For now we will just work with a single box serving a single domain as an example. If you are lucky enough to run a linux distribution with rolling updates or are running at the bleeding edge this is the simplest way to install Let’s Encrypt. At time of writing there is no official Ubuntu PPA for <= 14.04 LTS, however you’ll be able to apt install on Ubuntu 16.04 LTS. Finally the manual git version, I don’t recommend this method since this will rely on the letsencrypt-auto tool which will attempt to install itself and dependencies onto your system. It’s basically a giant bash script, if you are cool with that it’s well documented on their GitHub Page and I suggest you look at the script before using it, so I’m not going to cover that here. I’ve also created a “webroot” directory, this is where Let’s Encrypt will store it’s temporary files for domain verification. Let’s Encrypt has to verify that you do truly own your domain for which we want a certificate, otherwise anyone could create certificates for any domain and that would be a very bad thing indeed. We will be using the “webroot” authenticator which will, upon a signing request, call a defined url on port 80 for the domain you wish to sign. This will usually be http://your.domain.com/.well-known/acme-challenge. Provided Let’s Encrypt can access this and everything is OK you’ll be granted your certificate. I recommend you read up more about the internal workings of Let’s Encrypt here. 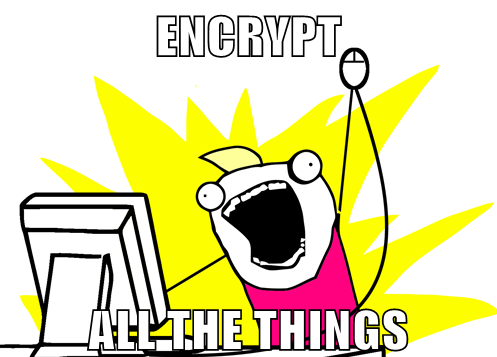 Ok, so we’ve got the basics — Let’s Encrypt is installed. Now it’s time to get to crux of the matter — certificate generation. First we need a web server. For this example, I’m using Nginx. It’s important to check for the existence of your certificate path since in the first run you won’t have any certificates and including the SSL server block in the Nginx configuration will prevent Nginx from starting. This is why on line 9 of the Nginx configuration we perform such a check. And thats it! Again we check to make sure we don’t have any certificates and if we don’t we will generate them with Let’s Encrypt. The command we use will automatically accept Let’s Encrypts Terms of Service, points to our configuration file and tells Let’s Encrypt we only want a certificate (the certonly bit at the end). The certificates created by Let’s Encrypt last for 90 days, So it’s important you renew them regularly. Fortunately this is a simple process we can automate with a bash script and a cron job. Here we will run a bash script on the 28th day of every month which will renew our certificate with Let’s Encrypt and reload the Nginx configuration. You now have a free automated SSL certificate serving your web site.